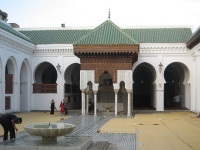 The al-Karaouine Mosque, located in the heart of the Fes El Bali (Medina), was founded in 859 with an associated madrassa (school) that subsequently grew to become one of the leading educational and spiritual centres in the Islamic world and is now called the University of al-Karaouine and incorporated into the modern university system of the country. According to UNESCO it is the oldest continually operating educational institution in the world. The mosque itself is enormous (one of the largest in Morocco) and beautiful, although austere, with many striking features. It is considered the most sacred mosque in the country and the timing of Islamic festivals across Morocco are determined here. Unfortunately for tourists non-Muslims may not enter it, but often the doors stand open and it is certainly worth taking a peek inside to get a sense of the place. The mosque is still surrounded by numerous madrasas, many of which are open to the public, and these are certainly worth exploring. The most famous of these is the Attarin Madrasa, built in the early 14th century, which features a beautiful bronze door and elegant courtyard with some impressive marble, alabaster and cedar wood decoration.